An altogether unusual beauty, Oliver Byrne’s edition of Euclid’s Elements combines bold primary color with mathematical precision in one dazzling display of color, form, and geometry. 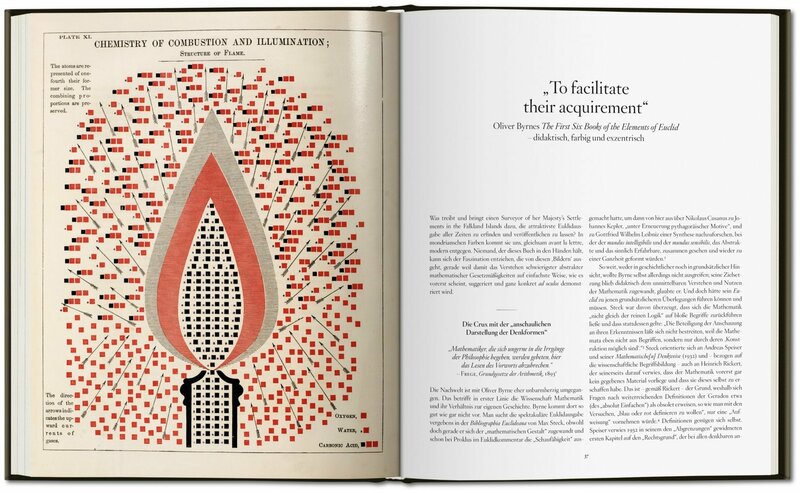 A masterwork of art and science, each page anticipates not only the vigor of De Stijl and Bauhaus but also the information graphics that define much of today’s data consumption. 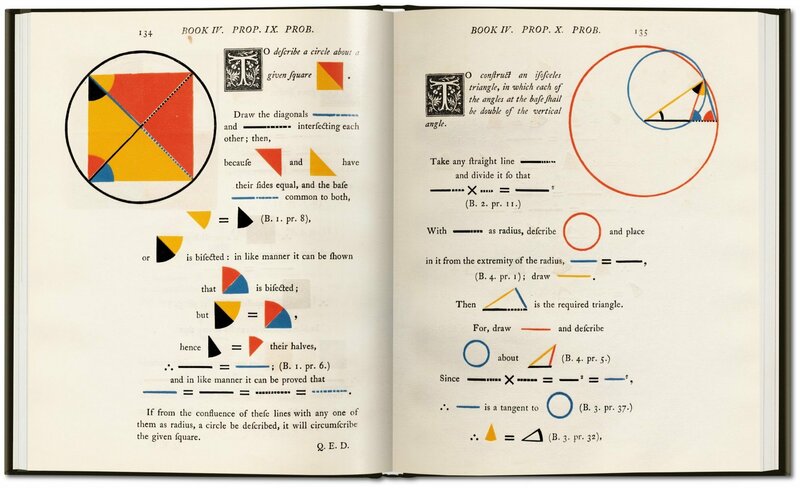 Nearly a century before Mondrian made geometrical red, yellow, and blue lines famous, 19th-century mathematician Oliver Byrne employed the color scheme for the figures and diagrams in his most unusual 1847 edition of Euclid's Elements. 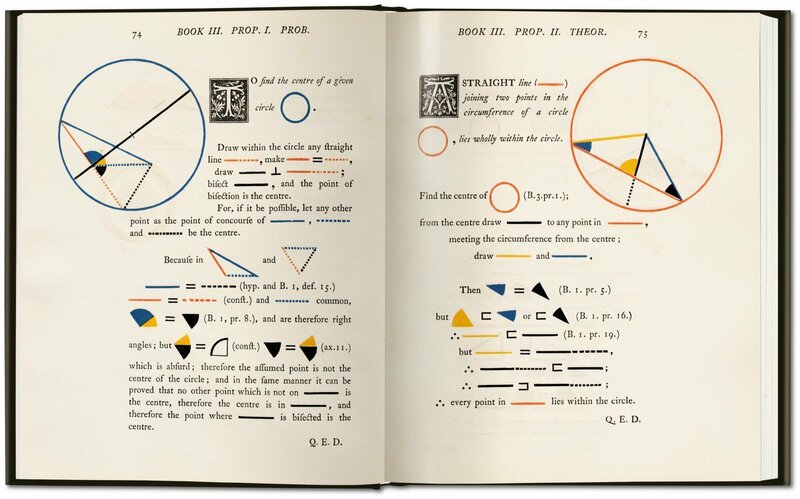 The author makes it clear in his subtitle that this is a didactic measure intended to distinguish his edition from all others: “The Elements of Euclid in which coloured diagrams and symbols are used instead of letters for the greater ease of learners.” As Surveyor of Her Majesty’s Settlements in the Falkland Islands, Byrne had already published mathematical and engineering works previous to 1847, but never anything like his edition on Euclid. 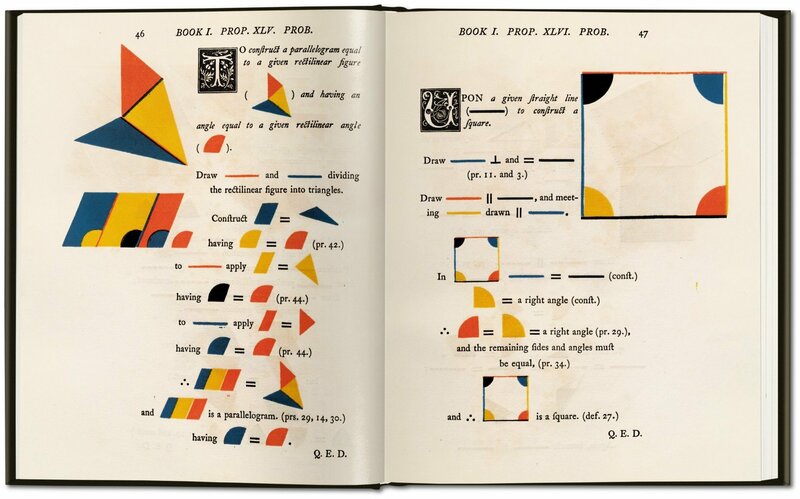 This remarkable example of Victorian printing has been described as one of the oddest and most beautiful books of the 19th century. 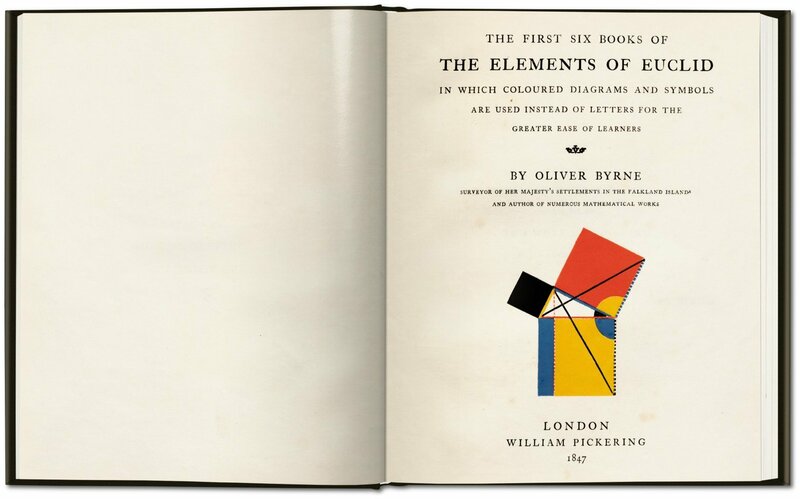 Each proposition is set in Caslon italic, with a four-line initial, while the rest of the page is a unique riot of red, yellow, and blue. 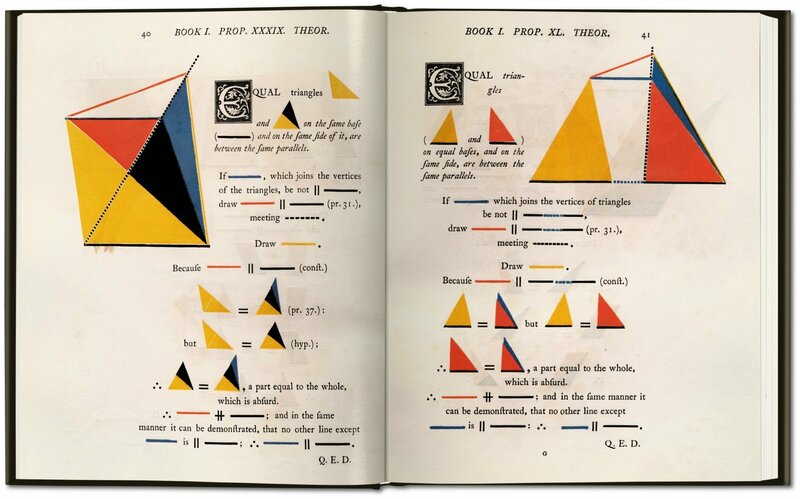 On some pages, letters and numbers only are printed in color, sprinkled over the pages like tiny wild flowers and demanding the most meticulous alignment of the different color plates for printing. 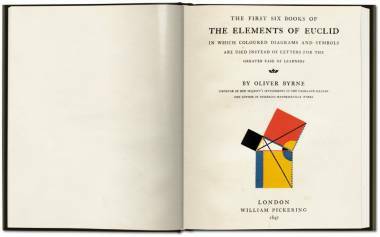 Elsewhere, solid squares, triangles, and circles are printed in bright colors, expressing a verve not seen again on the pages of a book until the era of Dufy, Matisse, and Derain. Werner Oechslin studied art history, archaeology, philosophy, and mathematics. After doctoral studies in Zurich in 1970 he taught at MIT and Harvard University. 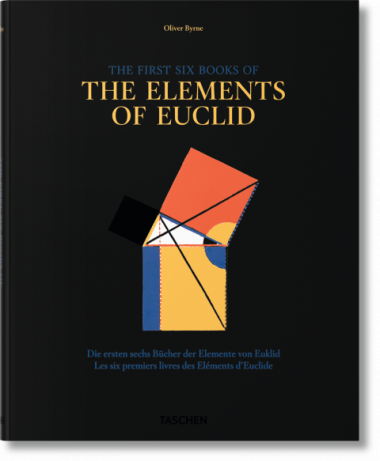 Since 1985 he has been a professor at the Swiss Federal Institute of Technology, where he led the Institute for the History and Theory of Architecture from 1986 to 2006. His research focuses on architectural theory and the cultural history of architecture. His most recent publication is Palladianismus: Andrea Palladio – Werk und Wirkung (2008). He is the founder of Bibliothek Werner Oechslin in Einsiedeln.